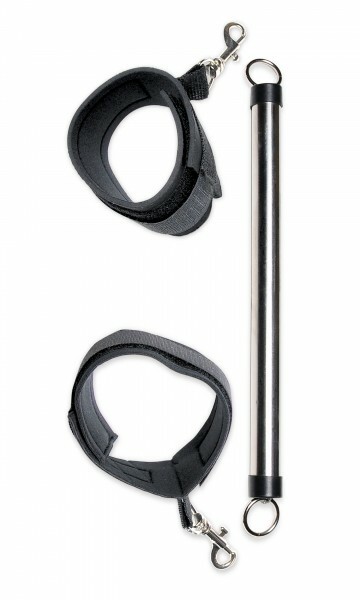 Fetish Fantasy Series Limited Edition Spreader Bar. Open wide! This beginner's metal Spreader Bar will put you or your partner in the right position for pleasure every time. Attach the adjustable ankle cuffs and your subject will not be able to close their thighs. Try new positions and scenarios you never dared, and do it all with easy access. They will squirm around and squeal, but they will not get out! The detachable cuffs have a comfortable soft-neoprene inner lining that is easy on the ankles. I've never seen one of these before, I admitted, half embarrassed, half intrigued. Relax and spread your legs wide open, this thing is harmless, he said as he gently cuffed each of my ankles into the soft neoprene restraints. The sleek metal rod separates both of my thighs and prevented them from closing, leaving me trembling in anticipation and open for anything. Unisex. Materials: Metal Bar, Neoprene, Plastic Cuffs. Item Dimensions: Length 28.5 inches. Bulk Weight5.90 ounces. Package Depth 3 inches. Package Width 5.5 inches. Package Height10.37 inches. Packaged Weight7.30 ounces. Country of origin China. Pipedream Products Catalog featured in 2012 Fetish Fantasy Limited Edition page 7.